The demand for pod-systems on the market is growing steadily, this can be noticed by the large number of manufactured devices from different manufacturers every month. Also, indirectly, this suggests that more and more people are interested in vaping. From time to time, among the usual rectangular “flash drives” come across devices with an interesting and unusual design. One of these devices is the Karat pod system from Smoant, a Chinese manufacturer. 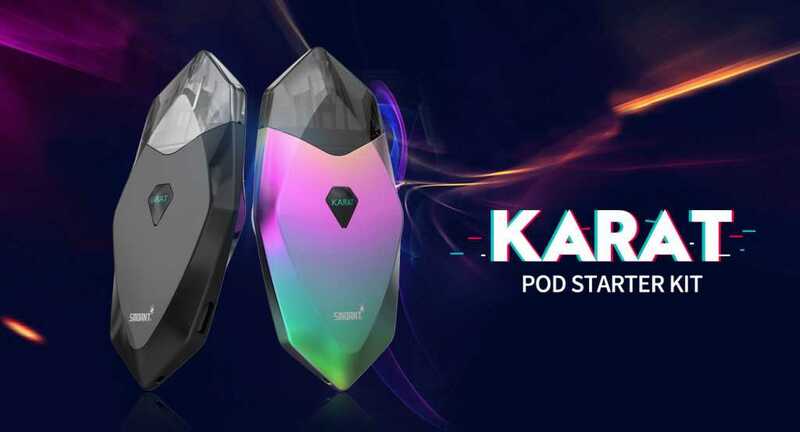 Externally, Karat resembles the company’s previous pod-system, the Smoant S8 Pod , but now it has got pronounced edges and quartz evaporators. According to the manufacturer, the new evaporators should soak faster, it is better to transfer the taste of the liquid and work longer than regular spirals. And how are things really? 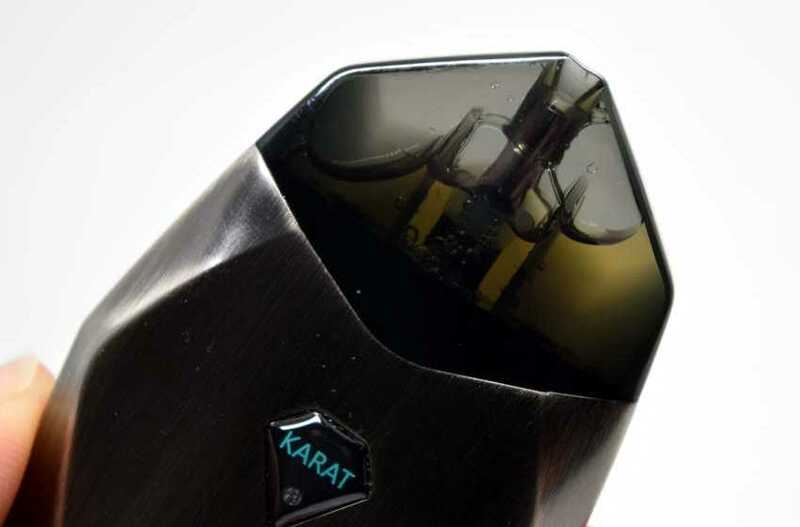 From the name “Karat” it becomes clear that the design of the device is based on the appearance of the diamond. Sharper, but beveled edges contribute to the creation of this image. In this case, the device is comfortable to hold and it does not cut into the hand. Karat is made of zinc alloy and is available in 5 different colors: blue, black, gun metal (Gun Metal), gradient blue and rainbow. The coating looks good and solid in any color options. The dimensions of the device are very modest and are 88 mm in height, 48 mm in length and 12 mm in width. This is a rather thin and lightweight device that is convenient to carry in your pocket. Like most pod-systems, Smoant Karat has no buttons, as it automatically works by puffing. Consists of battery pack and refillable cartridge. On the front panel is a diamond logo with LED battery charge indicator. On the side is the micro USB port for charging the device, and the bottom of the lace hole. Build quality is on top, all parts fit well. Not all users liked the blue “Karat” inscription near the indicator, as it is not particularly color-matched with the overall design. Also disadvantages include a rather slippery surface of the case. 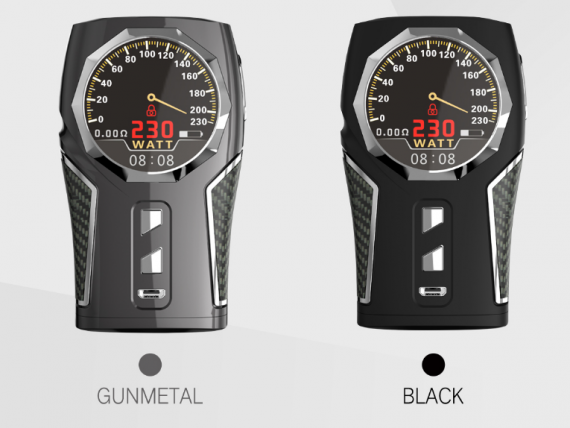 Smoant Karat has a built-in battery with a capacity of 370 mAh, which is pretty good, given the size of the device. 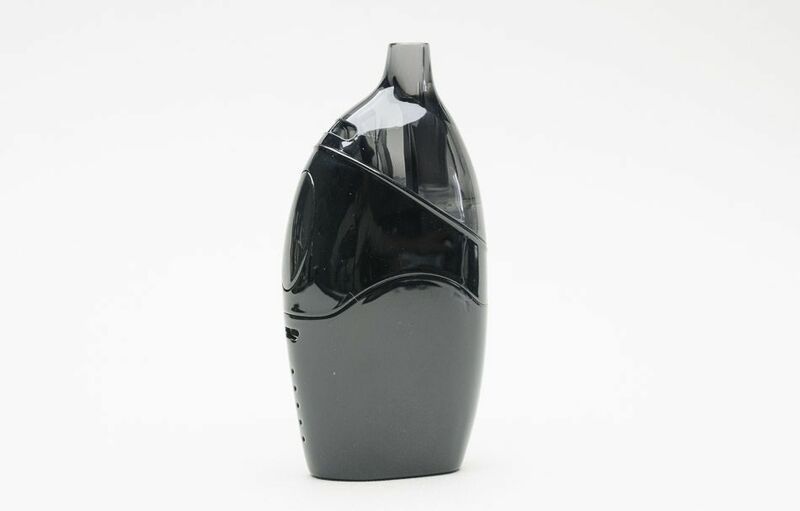 But this is definitely not enough for the whole day with intensive use, which the manufacturer himself does not hide, indicating the resource from one full charge of about 220 puffs (about a little more than half a pack of tobacco cigarettes). 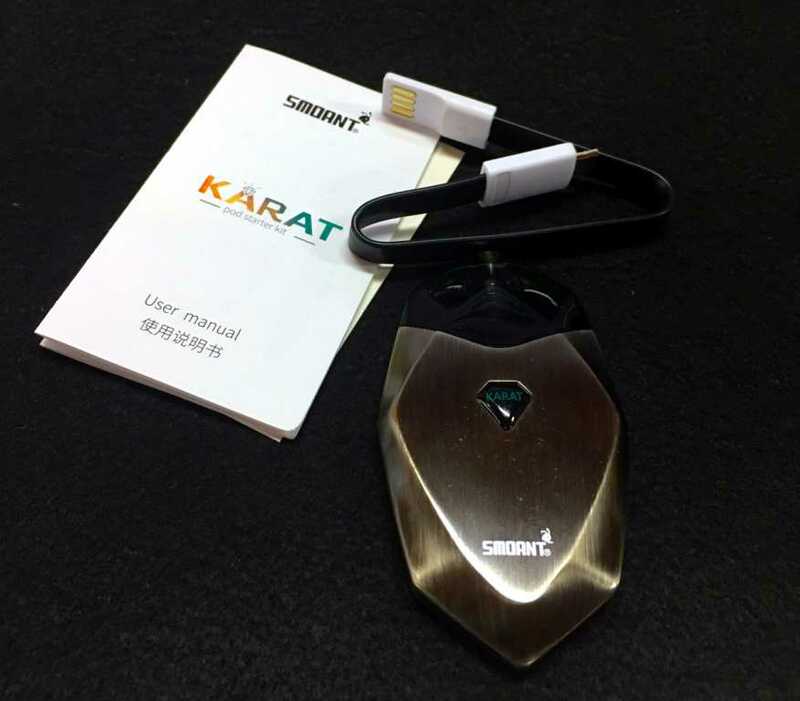 This can be compensated by the presence of the pass-through function, which allows Karat to be used during charging. True, the USB cable from the kit is very short and in order to make the puff you will have to lean heavily towards the device, so here you have to compromise and use another longer cable. 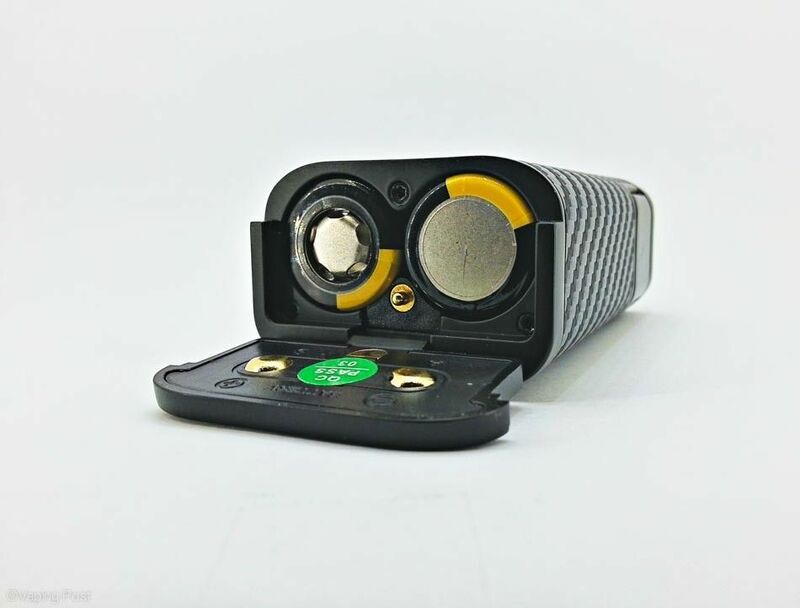 The advantages include working at a stable output voltage of 3.3-3.4 V. In theory, this means that the device supplies the same voltage both when fully charged and when the battery is discharged and the user does not notice the difference when pulling. In fact, when the battery is discharged below 30%, there is a slight drop in steam capacity and temperature. 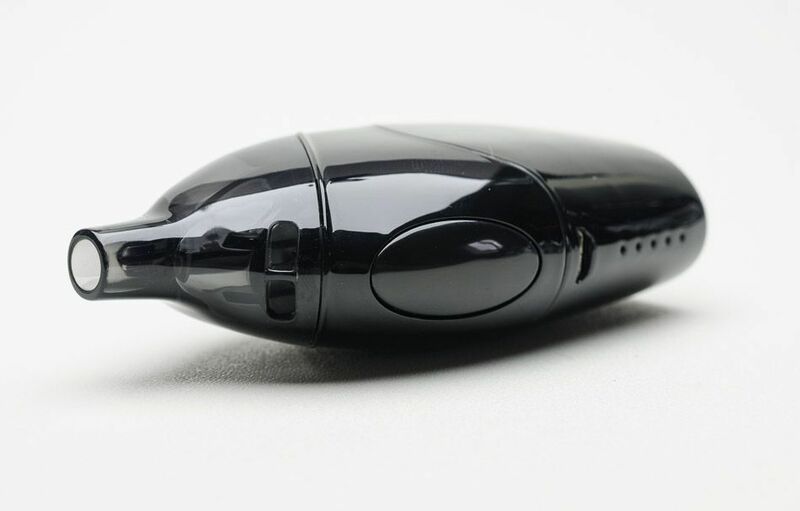 The pod system is equipped with a LED battery indicator. When the charge level is more than 30%, the indicator glows blue, and when less than 30% – red. The device board supports a full set of protection, such as protection against short circuit, overdischarge and overcharge, and others. 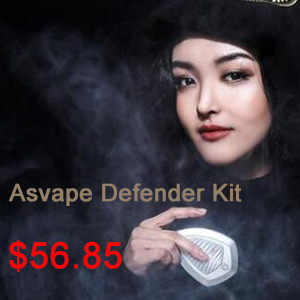 Focus On www.ave40.com For More Vape Kits. The kit comes with only one cartridge for reusable use with a quartz evaporator and attachment to the battery pack with magnets. All you need to do is fill the liquid for electronic cigarettes, give it a little soak and you can start using. Suitable liquids as a salt , and the usual nicotine. But considering the small capacity of the battery, it is better to use salt liquids in order to make less puffs during operation. Recommendations on the ratio of PG / VG manufacturer does not indicate, so it is best to use liquids with PG / VG 40/60 or 50/50. One of the most intriguing features of Smoant Karat is the new quartz vaporizer. It sounds new and innovative, but it’s just a name. In fact, the evaporator is a vertical space-coil (spiral with spaces between the turns), which is located inside the porous ceramic material and wrapped in organic cotton for better absorption of the liquid. The advantages of such an evaporator are that it lasts longer than regular spirals, is better impregnated with liquid and has a uniform distribution of heat. When using for the first time, the taste transfer leaves much to be desired. But after the second or third refueling the taste becomes richer. Cartridge capacity is 2 ml. Thanks to the tinted case, you can monitor the level of the liquid. At the bottom of the cartridge are two filling holes, closed with rubber plugs. The holes themselves are large enough for this kind of devices. It is recommended to open both plugs during refueling in order to allow the air inside to exit and avoid leakage, and also to fill the cartridge with no more than 90-95%. After filling, you need to tightly install the rubber plugs in place and let the cartridge stand for a few minutes so that the cotton is properly soaked with liquid. According to user feedback, when using clear liquids without sweeteners, the evaporator has been in operation for more than a week. When the taste of burning and third-party taste appears, the cartridge must be replaced with a new one. As for the puff, then it is tight cigarette , which will be a big plus for people moving from tobacco. The amount of steam in such devices is small, so Karat is suitable for unobtrusive use. 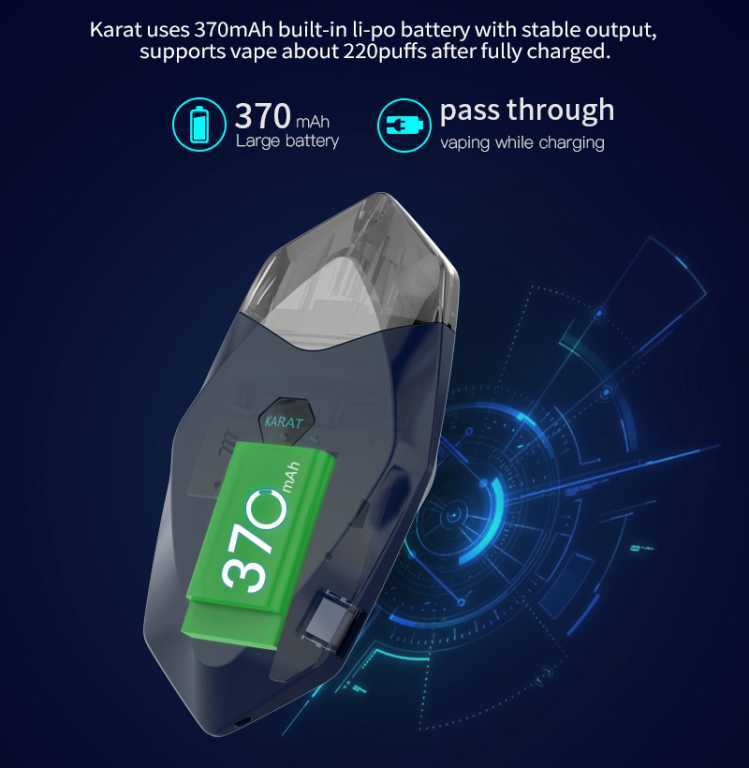 Smoant Karat has received many positive reviews due to its unique design, cartridge mounting with magnets, ease of use, constant output voltage and build quality. In terms of taste, it is also quite good, especially after the second or third filling. As for the performance and autonomy of work, then Karat could not stand out among competitors. Battery capacity even slightly below the market average and with less intensive use will have to be charged a couple of times a day. The cable from the kit is too short and it is not convenient to use the device while charging with this cable. Ijoy is definitely a company that innovates, as we have seen recently on the Vaping Post with the test of the RDTA Box Mini . This time, the manufacturer returns to the market of the powerful boxes with a lot of autonomy and proposes the first box embedding the new batteries in format 20700: the Captain PD270. So will this new format revolutionize the market? 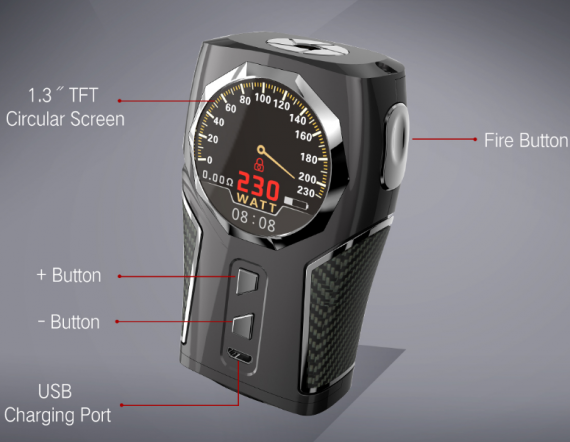 For Ijoy , there is no doubt that the 18650 format has had its day, and they proclaim it loud and clear. 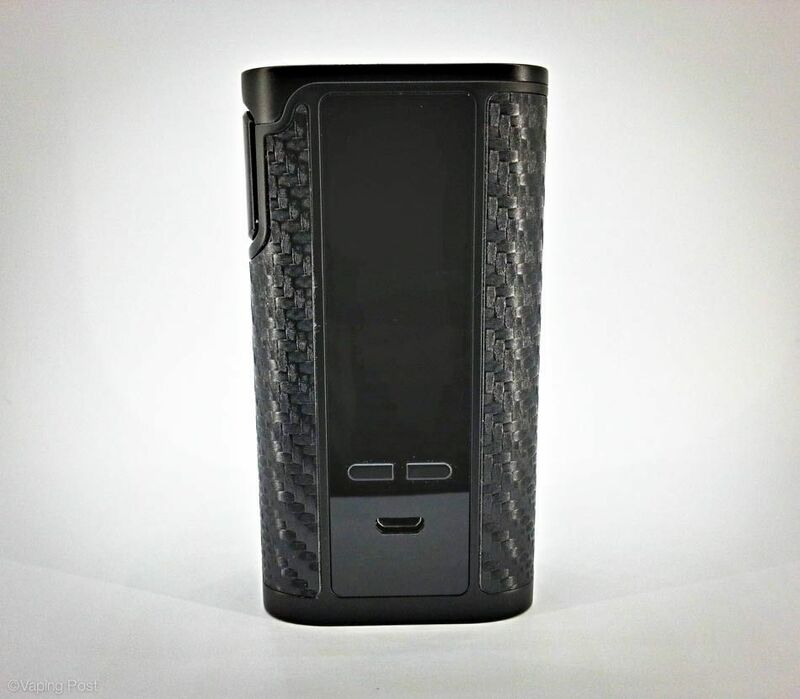 This new format, originally developed for the Tesla company, is making its first appearance in the world of vape. So that everyone can indulge in the pleasure of these 20700, the Captain is delivered with two of his batteries in the colors of Ijoy. Having a power of 3000 mAh for a discharge of 40 A, I could unfortunately not carry out further tests to know if the figures announced are real or not, my expertise in the field is limited to insert a batteryin the good sense in the charger. From what I have read on the web, we allow ourselves to think in authorized circles, that in reality, the values ​​are closer to the 30 A, but a true 30 A of excellent quality. Arriving painfully to draw 15A of my accuses on holidays, I still have the margin. One would think that 2 mm in diameter and 5 mm in height, finally, it is not much. But once in hand, the difference is real and it is hardly possible to be wrong. I think that if you want to get a double box battery of reasonable size to keep a good grip, this format may be the limit. Of course, the weight is also slightly more important: 46 g for a Samsung 18650 and 57 g for the 20700 Ijoy. Obviously, that says new format immediately think of how these batteries will be able to be recharged. For once, I did not see the contraindication notice to perform this operation through the box. However, being quite suspicious in nature, I still loaded these batteries with my charger, an Xtar Dragon. It just goes, but no problem. The format is different, but the embedded technology remains the same, and if your charger is able to accommodate the format 26650, I think it will be won, contactors often going up to 70 mm in length which will be the minimum. 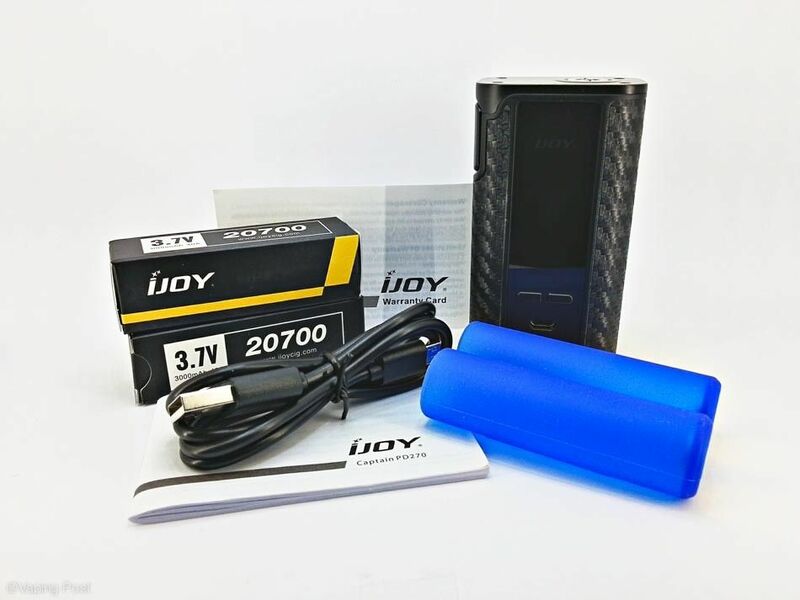 As usual with Ijoy, the box is sober and pleasant, and interesting content; accompanying the coveted object, there are therefore 2 batteries in 20700, a silicone adapter for 18650, a micro-USB cable, a manual in English and Chinese and a warranty card. The 18650 adapter has copper or perhaps brass contacts at the end. The batteries are inserted and withdraw perfectly, including those with a wrap of a layer. No difficulty to enter or leave the box. Thank you Ijoy for thinking about this handy accessory. With two 20700 batteries on board, the Captain still displays 285 g on the scale. Add to that its respectable dimensions, it is decidedly in the presence of a box that will prefer the interior of a home rather than the back pocket of pants. 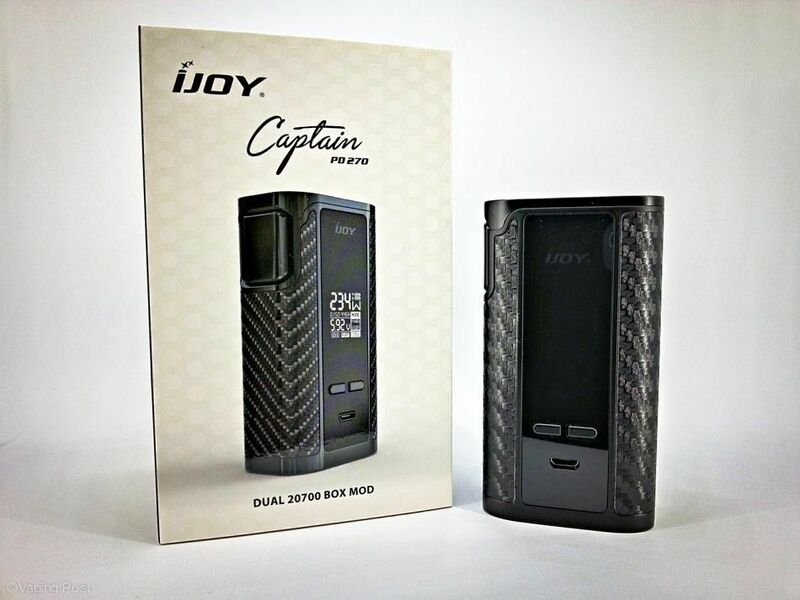 Despite this overweight, I think Ijoy has done rather well and the Captain has remained compact enough to be easily manipulated by those who do not have a giant hand. The main face is composed of a central strip of glass 23 mm wide over the entire height which in addition to being very pretty, will be particularly inclined to retain fingerprints and unfortunately also sensitive to scratches. In the middle of this strip is a very bright 17 × 17 mm (0.96 inch) OLED display, displaying all the useful information: power, the separate charge level of the batteries, the resistance value, the power of Amp output, output voltage (replaced by temperature in TC mode), vape mode (W or TC) with preheat , the number of puffs and the time of the last puff. If the display of the power is well displayed in large characters, the mode of vape (W or TC) is as for him little readable, because rather small and relegated in bottom right. Those who navigate between these two modes may need to be a little more careful, because it is difficult to know at first glance, especially after fifty years, in which mode is the box. 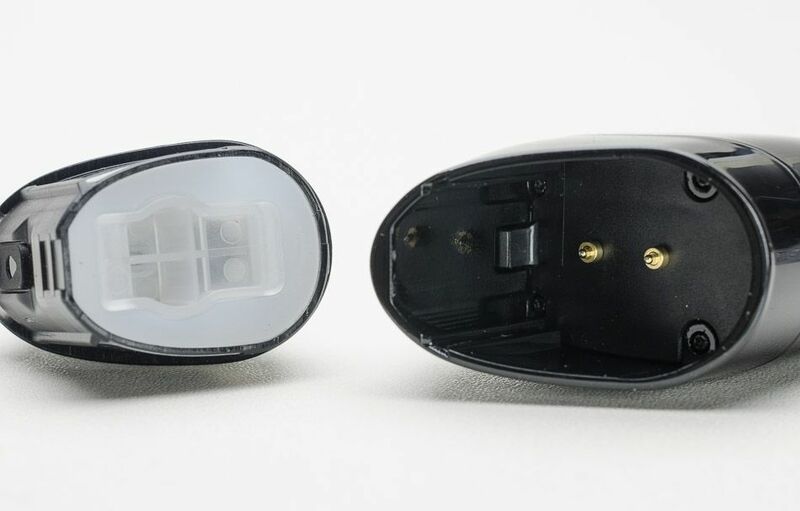 Below the screen are Tic and Tac, the + and – buttons that produce this soft eponymous click, and finally the micro-USB plug that will serve, as you can imagine, to reload the box and update it. On both sides of the screen, and on the slices and identical on the back, the coating is carbon of the most beautiful effect and offer excellent grip. The design is quite successful, pleasing to the eye. The Captain exists in 3 shades: black, gun and rainbow. Whatever the color, all the boxes have the carbon coating, but if you do not find that to your liking, there are eighteen different stickers to modify this aspect. I do not know if they will ever be imported to France. On the left side is the fire button. Of good dimension, 23 × 20 mm, it is perfectly flush and curved on the sides for better accompanied the periphery of the box. Easily found, it can be operated by pressing a little anywhere on its surface, except oddly down. The click is firm, without any game and produces a sound common to this type of button. 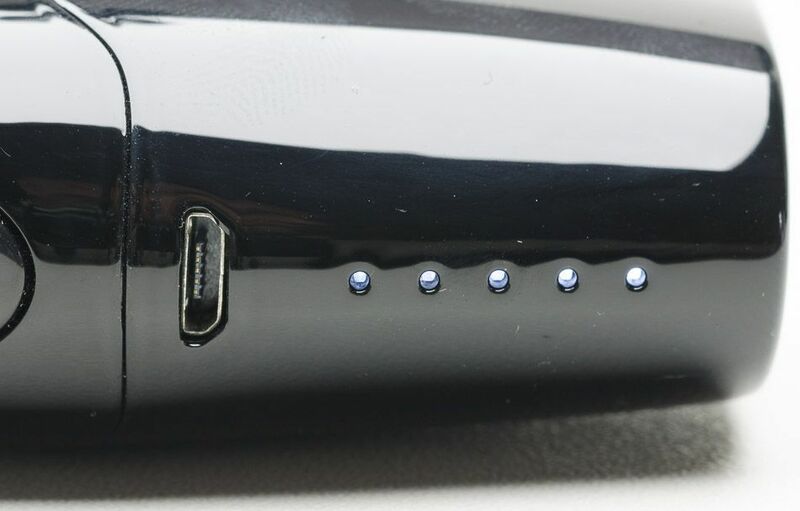 The layout of the rear face is identical to the front, with a discreet Captain logo in the middle of the glass band, go to the top cap that has only the connector 510. Of good length, it has of course a positive stud mounted on spring. 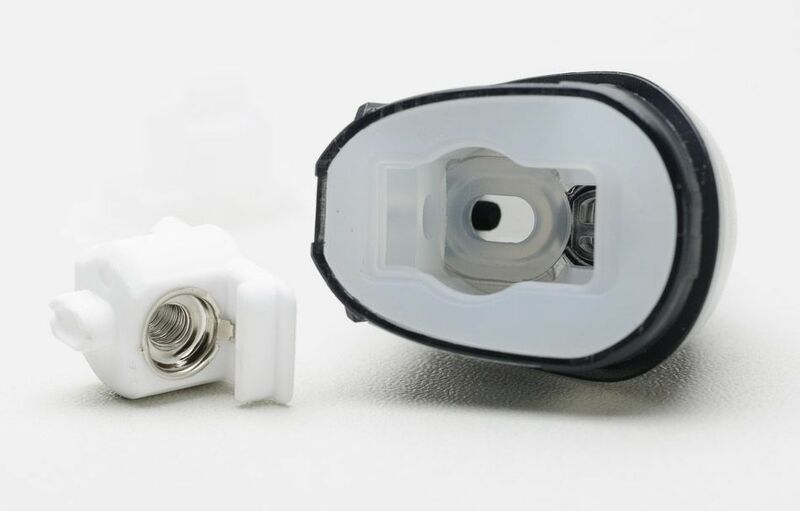 At the top of this connector are four slots for ventilation of atomizers with an air intake from below, all very slightly raised compared to the top of the box. This solution certainly protects the box from scratches when you mount and dismount an atomizer, but on the other hand, reveals a small gap between the box and the bottom capof the atomizer. 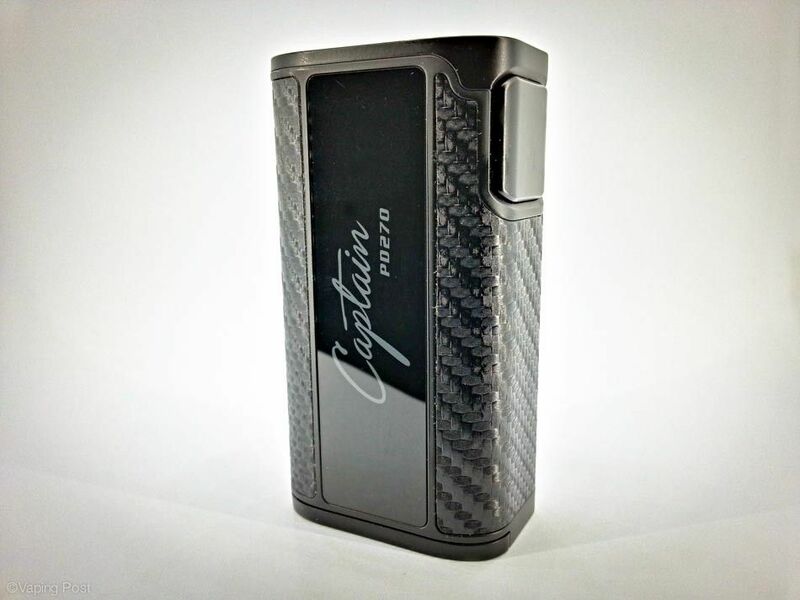 Of course, with its 32 mm thick, the Captain will receive all the sizes of atomizers today. The battery insertion door is logically located below. To open it, push it backwards, a small groove in the center to insert a fingernail to facilitate the operation. The most attentive reader will notice that there is no degassing hole for the batteries. nor even to ventilate the chipset by the way. We hope this hatch is completely permeable, because two 20700 that degas it must be something. The hinge presents a normal game, the inscriptions on the polarity of the batteries would have deserved to be a little more legible. Once the batteries are inserted and the hatch closed, nothing moves if you shake the box, including a 18650 and the adapter. The same goes for the buttons that remain very wisely in their place. The Captain is very well assembled with quality materials, I do not really have any complaints to him. 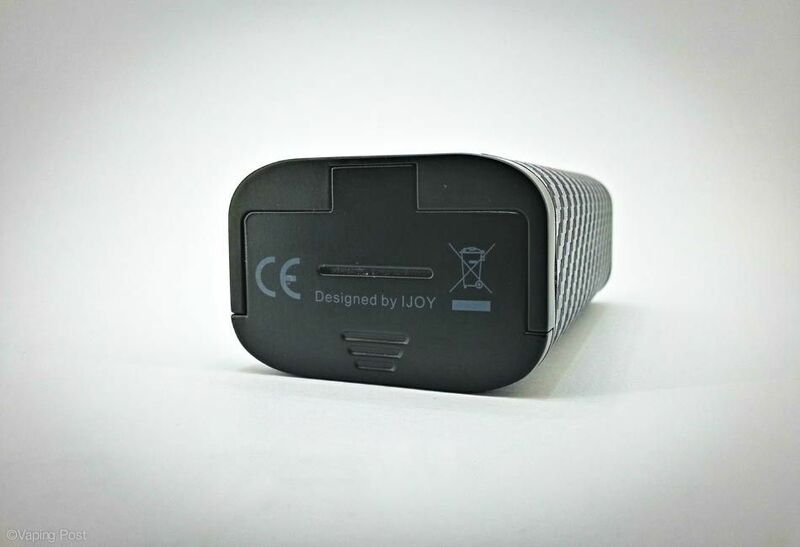 Traditionally at Ijoy, the chipset was developed by IWEPAL, which once again did a good job. The power, temperature control and TCR modes are available, with 2 memory slots accessible for the TC and two others for the TCR. 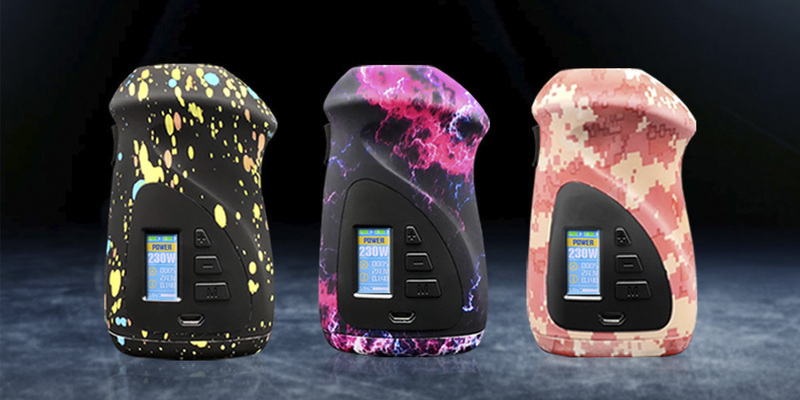 Apart from the inherent settings of the vape mode, which essentially consist in choosing the power or the temperature, the other possible settings are the reset of the puff counter and the display duration that can be chosen between 10, 30, 60 and 90 seconds. That’s all, and for my part, I find it very good. The learning will be done in 2 minutes and hop, we vape. No update of the box is available, I have not tried, but there is no reason that it does not work. The USB charging is going well, the box does not heat up, but the charging intensity seems limited to 1A if I judge by the time it puts to fully reload the 20700. Note that the mode passthrough n is not available and of course, all the protections are present, only classic. The vape produced by the Captain is of quality, without any variation of vape, the box being very reactive. Regarding the autonomy of the 20700 and to give you an idea, I can shoot about 400 puffs of about 6 seconds at an average of 27 W until the message indicating who needs to recharge, knowing that they are not still honed. These 20700 are therefore a good choice for those looking for power and / or autonomy.
. So who’s the boss? Not easy to find a real fault with the Captain. It is powerful, well finished, has a range of 6000 mAh and has a value for money very interesting. With the Captain, Ijoy certainly marks a milestone that other manufacturers will soon follow, for sure. In the meantime, I can only advise you this box, you will not be disappointed. VooPoo is mostly known for their mods, especially after the massive success of the Drag. They have released one RDA before, the Demon but that didn’t seem to entirely take off. The second entry into the market, the Rune RDA looks far more impressive. It features a postless deck with unique bottom airflow and an 810 resin drip tip. It’s available in 6 colors; Silver, Gold, Black, S-black, S-blue, and Rainbow. Good build quality, nice postless deck, innovative airflow, extremely deep juice well, good flavor production. Not the most wide open airflow and can be a little noisy. The Rune is an extremely solid RDA, which is very impressive considering it’s only VooPoo’s second attempt. It has a decent postless deck and unique airflow design that work really well for a restricted DTL vape. It can be a little noisy with the airflow but produces very good flavor. The Rune RDA has all the ingredients to be an impressive RDA by its design. There’s a raised postless deck, unique dual bottom airflow, and substantial juice wells making it suitable for both dripping and squonking. The Rune is 24.6mm in diameter and comprises of 4 sections, the build deck, main chamber, top cap and 810 resin drip tip. The VooPoo Rune is one of those strange RDA’s that you look at and sometimes think it’s nice looking, and other times not so much. It’s a large RDA, so it’s hard not to notice certain aspects of its design, like the steps between the main chamber to the top cap, to the drip tip. 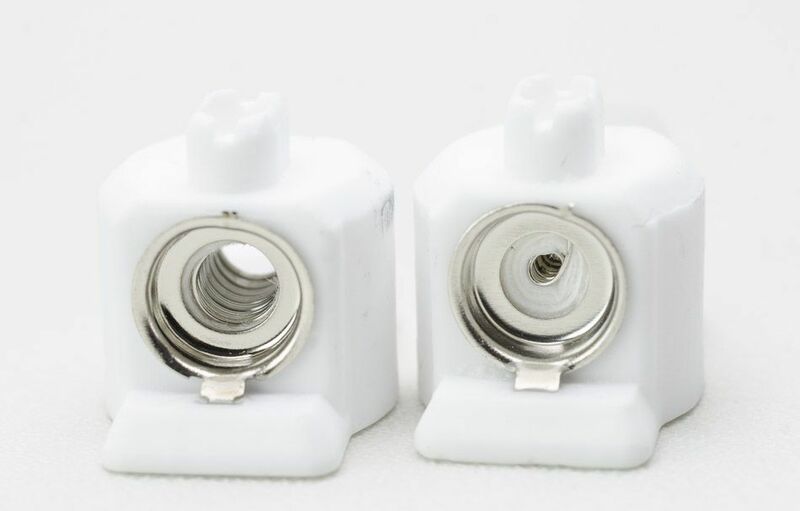 I understand why they’ve designed it this way, as it seems the top cap acts as a kind of heatsink to the main stainless steel chamber, which does get quite hot during vaping, It also makes it easier to remove the top cap to check your build or drip. However, it’s not the most appealing overall look. I do like the subtle engraved VooPoo branding on the main chamber, and the Runic inscription pattern across the circumference of the top cap, which gives it some character. So it’s not the most attractive of RDAs, but certainly won’t look out of place on most mods, and there are plenty of color options to pick from. The build quality of the Rune is very good, especially as it’s only VooPoo’s second RDA. All of the Stainless Steel construction feels solid, and the threading on the 510 pin is nice and smooth. The gold-plated BF pin also feels very sturdy. The tolerances of the O-rings on the base of the deck and the top cap are spot on, not too tight or too loose. The Rune certainly features some form of innovation in the way they have integrated the postless deck and airflow. Although there’s unquestionably some inspiration taken from other RDAs, as always seems to be the case nowadays. The way the coils sit in the postless deck, with the airflow coming in from the bottom and traveling up tubes is much like the Vandy Vape Phobia. But the four adjustable airflow holes (created by the top cap) and the way the airflow tubes divide into two separate airflow slots, pointing in different directions is unique. The build on the Rune RDA at first appearance may look somewhat alien, but it is just a standard postless deck. You have two terminals on either side of the deck to place you coil legs down vertically. Then there are two flathead screws on the outer side of the base, the screws are good quality, but I would’ve like to have seen some hex screws as spares. Postless decks are not the easiest for beginners to get used to, as you have to be aware of what length you need to cut your coil legs for best positioning. I found that leaving around 5mm coil legs seemed to work just fine. Once you’ve tightened down your coil legs, it’s relatively easy to maneuver the coil around, so it sits above the second flat airflow hole, with the angled slot facing the outer underside of the coil also. With the coil in this position, it also means there is plenty of clearing to where the chamber and top cap sit over the deck, so you’ll avoid any shorting. It’s not a small build deck, so you do have plenty of room to place sizeable inner diameter coils inside, but due to the nature of the airflow and the positioning of the slots, I think 3-4mm ID coils with thicker wire will work best. The Rune has absolutely huge juice wells on either side of the build deck, measuring around 12mm deep. There are even two indents further down in the well to lay your cotton in to, so wicking it really couldn’t be easier. The Rune has a bidirectional juice port raised from the base of the deck that sits dead center. The juice flows perfectly to each well, but due to the juice port being raised it will only draw excess liquid back if you really over squonk. And over squonking doesn’t become an issue with the Rune. Firstly, the juice wells being so vast can hold a lot of cotton, which will inevitably soak up most excess juice. Secondly, the airflow holes are also extremely raised from the deck, so it would take quite a bit to get the juice go down them. The Rune is a bottom airflow RDA with one large angled air hole on either side of the base. Then the main cap or chamber has two 4mm wide square air holes on each side. They too have slightly angled edges to them. This enables quite a bit of diversity when it comes to airflow options, and you can close it right down to get a very restricted DTL vape. The main cap as an AFC control is really easy to adjust, as you are just turning the whole cap. It has stoppers either side so it won’t spin freely, which also makes it easier to slot it in position and remove the RDA from your device. As I mentioned before the O-rings have good tolerances, so it holds well in place. I was actually really impressed with the performance of the Rune RDA. It may not be the best cloud chucking RDA or the most intense flavor producer, and the build deck isn’t the easiest to work with. But overall it still does an excellent job at all of those aspects. You could potentially use it as a single coil setup, but that’s not really what it’s designed for, so stick to a dual coil. I would say those looking for a slightly restricted DTL experience from a dual coil RDAwill get the best out of the Rune. The Rune RDA does produce very good flavor, it’s maybe not quite the best on the market but is in the upper echelons. As with most dual coil RDAs though, it really comes down to the build you’ve used. The Rune is not suited to a lot of wraps or small ID coils, and I got best results with fused Claptons with around 3.5-4mm ID. The flavor is definitely there with this RDA; it’s just a little less forgiving than some others on the market. I thought the airflow was going to be a little turbulent and have a whistle to it because of the way the airflow is split. Surprisingly it is actually fairly smooth and enjoyable, although it can be a little noisy especially with one hole closed off. The Rune is not going to provide an extremely wide open draw like the Bonza; it’s a little more restricted than that. I think it actually works best as a restricted DTL vape with the airflow closed down a touch, as the flavor comes through and it’s a more saturated vape. The Rune RDA ended up performing a lot better than I anticipated it would. The airflow is reasonably smooth, and it produces excellent flavor if you get the build right. It may not have the most eye-catching aesthetics, but it does have very good build quality. I really like the fact that VooPoo tried to do something different with the airflow, and this combined with the considerable juice wells make it absolutely ideal for squonking. It’s not ideally suited to those looking for a really wide open vape, as the airflow is a little restricted. It works best with medium wattages builds and a slightly restricted DTL. Overall it’s a very good dual coil RDA, and one that I’d certainly recommend if the style of it suits you. Innovations in vaping technology can seem slow to come by. One of the most recent ones was the advent of temperature control, but since then it seems like all any manufacturers have been doing is either making their mods smaller or higher powered. That’s all changing now, because touch screen mods are finally here. We’ve got one to review today, the Joyetech CUBOID Pro. It’s not the first one to hit the market, but it looks like a very good one, and we’re excited to check it out. I know there is one thing that everyone wants to know. I won’t make you wait. The touchscreen is awesome! I don’t just mean that it’s awesome to have a touchscreen on a vape though. Joyetech did a seriously incredible job making this vape. The screen is big, bright, and responsive. I love the interface. Everything you could possible want is easily accessible. There are plus and minus buttons for changing the wattage incrementally, along with a bar that you can drag to quickly make large adjustments. There’s a button for toggling between the different heating modes, and a place to press so that you can change what you are adjusting within each mode. If that all sounds confusing, what I’m trying to say is that the majority of things that you want to do can be achieved without ever leaving the main screen. By the way, everything is easy to press, even if you have fat fingers. On top of just having a good touchscreen, there are a bunch of cool extra features like screensavers that are real pictures, a step counter, and even a way for you to track your nicotine consumption. It’s cool to see vapes expanding on their functionality like this. There are two buttons that will make this fire. One is a traditional click button, and the other is activated just by touching it. I’m not a huge fan of the touch fire button, but it’s there if you like it. This kit includes the ProCore Aries tank, which delivers outstanding flavor and vapor production. There are 2 different coils that are included, with an additional 3 that you can buy separately. If you get this, you’ll notice that they include a card that indicates exactly what each coil is good for. I like this inclusion, and the card’s judgements are accurate. In this case, the ProC4 is the one to use if you want a coil that’s big on both flavor and vapor. Both of the included coils are for direct lung vaping, but you can achieve mouth-to-lung vaping if you buy the ProC1-S. If you like blowing huge clouds and vaping at high wattages, check out the 0.2ohm ProC3. The power flexibility of this kit is great, and right on par with other mods coming out lately. It’s powered by two 18650’s with a maximum wattage output of 200W. There are temperature control modes for nickel, titanium, and stainless steel, with a range of 200-600F for each. There are also TCR modes. The resistance ranges are 0.05 to 1.5ohm for the temperature control modes and 0.1 to 3.5ohm for variable wattage mode. One of the downsides of high-powered mods that pack a ton of functionality has traditionally been the fact that their menus are clunky and annoyingly complicated to navigate.There are some that do it better than others, but at the end of the day most mods still only have three buttons. The touch screen changes everything. Instead of remembering combinations of button clicks to find and change what you want, you just click on it. This is so much more intuitive, and it makes this mod extremely easy to use. I can’t speak highly enough about it. I’m actually surprised by how portable this is. I assumed that adding in all the tech to make this touch screen would make it bulkier than other dual 18650 mods, but it really isn’t. The size is 131.5x56x30mm. That’s just a bit over 5 inches tall, in case you were about to go look up the metric conversion. The Joyetech CUBOID Pro is an incredible mod, and the ProCore Aries tank is pretty great as well. The star of the show is obviously the touch screen. If you were worried that it wouldn’t be functional and that it is just a gimmick to sell more vapes, I hope this review convinced you that it’s not. The thing works great and makes using the vape much more enjoyable. I’ve said it before, but I’m going to repeat myself for emphasis. The screen is big, bright, and incredibly easy to use. I’ve never used a vape with this many settings that was more intuitive to control. While this will fit any 25mm tank, the ProCore Aries is worth using. Regardless of how you like to vape, there should be a coil for this that helps you do it. My favorite was the ProC4. Today we’ll be taking a look at the Joyetech CUBOID Tap. 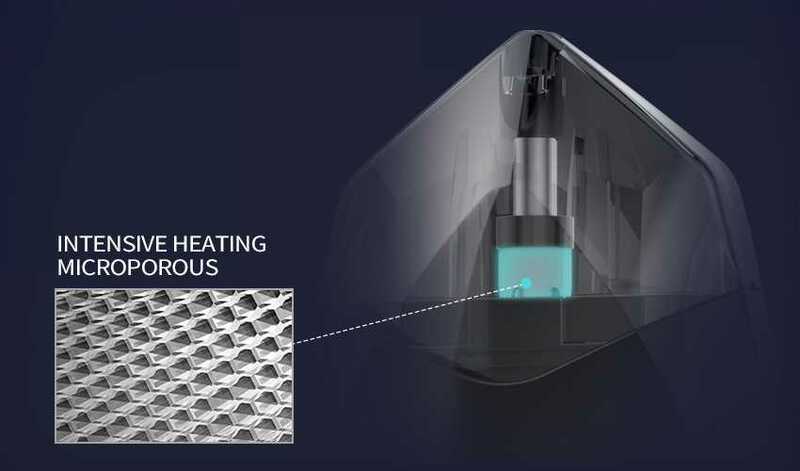 The Tap features a bunch of interesting features, including touch-activated buttons and a pressure activated menu, meaning you can squeeze the entire device to do certain things. If that sounds a bit confusing, don’t worry because I’ll make sure to explain it fully below. The manufacturing quality of the CUBOID Tap is good, but it definitely seems like they packed a bunch of features into this just to see what people like and don’t like. Let’s go over the unique features now. For starters, you have what they call ‘TAPTEC’ technology, which simply means that several of the buttons aren’t activated by clicking them. You just have to apply pressure, and then haptic feedback (vibration) lets you know when you’ve pressed hard enough. There is still a normal fire button that you have to click, but there is also a big taap area on the front that will also cause the device to fire. The up and down buttons also have this taptec functionality. Like I mentioned in the intro to this review, the entire mod is also ‘pressure sensitive’. This means that you can squeeze the mod without ever pressing a button and it will register the number of times you squeeze it and do certain actions. For example, you can squeeze it three times when the device is on and that will lock and unlock the tap buttons. I can kind of see the value in some situations, but then there are others like squeezing it three times in power off condition. That allows you to set the TCR value. How is this a valuable feature? It certainly doesn’t make it more intuitive to use, at least in my mind. Other things worth knowing are that this is powered by dual 18650s and that it has two amp micro USB charging. The mod itself works exactly like it should, so the flavor and vapor are really just dependant on the tank. We’ve talked about the ProCore Aries tank before, but we’ll do it again since it’s included in this kit. The short version is that I really like the ProCore Aries. The coils for it work very well, and there are 5 different options that accommodate very different vaping styles. Two are included with this kit, the ProC1 and the ProC4. The ProC1 is a good all-around coil, but the ProC4 delivers better flavor without sacrificing vapor production. Of the three additional styles you can buy, the two that jump out are the ProC1-S and the ProC3. The ProC1-S will allow you to do MTL vaping, while the ProC3 will deliver bigger clouds than any of the others. The power flexibility on the CUBOID Tap is good. 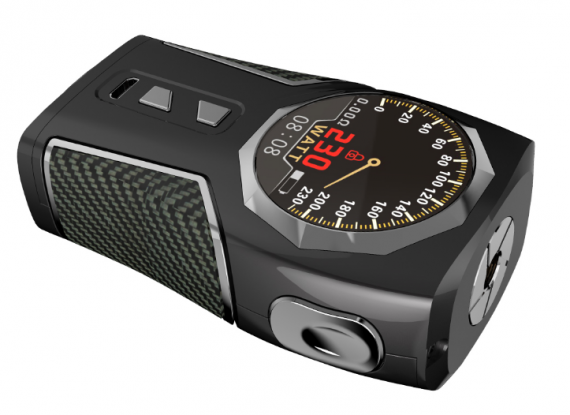 It will deliver up to 228 watts, and it also has temperature control modes for nickel, titanium, and stainless steel. The temperature range is the standard 200-600F. There is also a TCR mode. The resistance range for the temp modes is 0.05-1.5ohm. For wattage mode, it’s 0.1-3.5ohm. Maybe it’s because I’m reviewing this after reviewing the CUBOID Pro, but I think this is a little complicated. The menu isn’t nearly as intuitive, and the combination of taps and squeezes just leaves me confused at times. I’m not sure if you can tell, but I really don’t like the squeezing, at least not how it’s set up. The screen is at least fairly big and easy to read, but I’d still take the Pro over the Tap any day. The portability of this is what you would expect for a dual 18650 vape. It’s no bigger than others like it, but it’s still not going to be a great choice for carrying around in your pocket. Obviously people still will, but you’ll know it’s there if you do. One downside that I see with this is the potential for all the pressure and touch activated stuff to be accidently engaged when it’s not in use. If you get this, just be careful and keep the touch stuff locked if you have it in your pocket. I’m not a big fan of the Joyetech CUBOID Tap. There are a lot of new features, but I’m not sure how useful any of them really are. They’re certainly interesting, but I never felt like doing things was easier because of them. I’ll be honest, I think my opinion is also being influenced by the fact that I just tried the CUBOID Pro. Where this has touch buttons and pressure sensitivity, the PRO has a full touch screen. 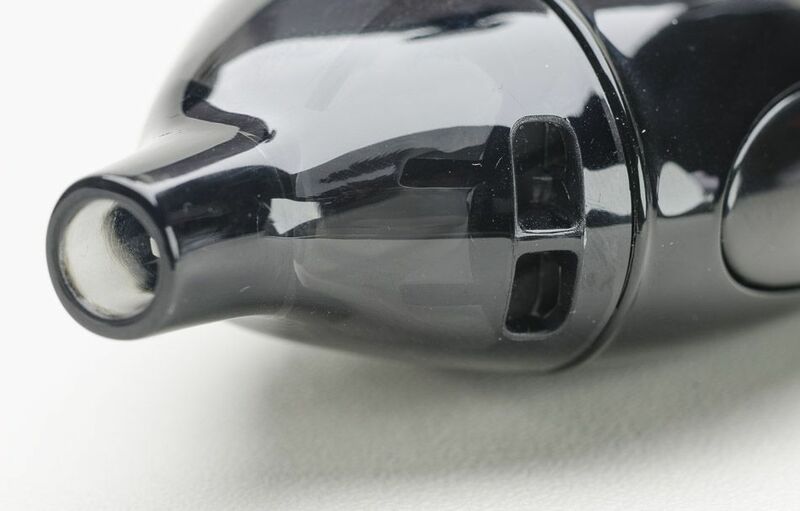 Unlike the Tap, the Pro’s innovations actually made using the vape significantly easier. As I said in the review, it may be the easiest vape I’ve ever used that has as many settings as it does. The Joyetech CUBOID Lite is a small 80W mod with a 3000mAh internal battery. It features a big screen with color display, but it doesn’t have a touch screen like the CUBOID Pro. The kit comes with the EXCEED D22 tank. As far as small, pocket-friendly mods go, I think that the CUBOID Lite is exceptionally well made. For the most part, this has the same features as most other mods. The thing that sets it apart is the screen. While it isn’t a touchscreen like the CUBOID Pro, it is remarkably big considering the size of the device. It’s also very bright and crisp, plus it displays in color. While this may not be necessary for the basic functionality required of a mod, I think that it makes the overall experience much more enjoyable. It certainly seems more modern considering we’re all used to the high resolution screens of our phones. This has an internal battery with a 3000mAh capacity. This is a respectable battery size considering the size of the mod, and you also get 2A charging. 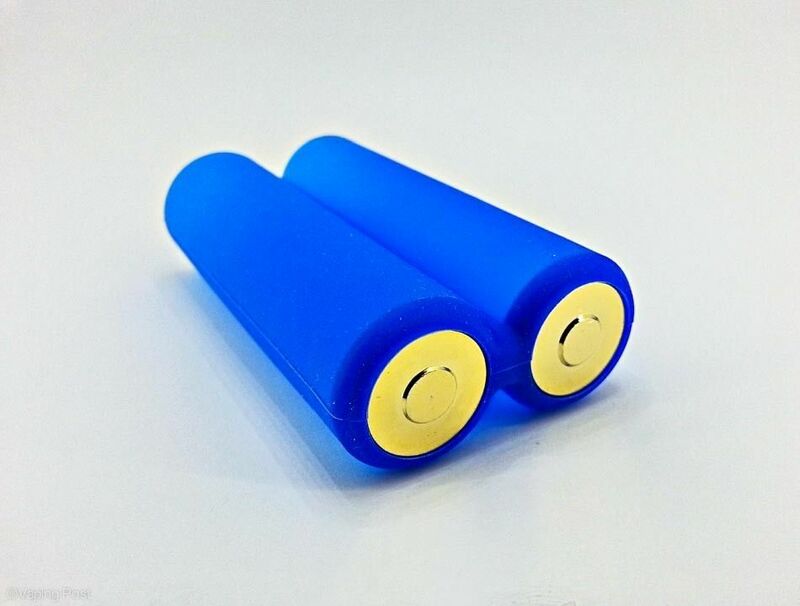 If you are getting a mod with an internal battery, 2A charging is very important because it significantly cuts down on charge time compared to the standard 1A. This also has a built-in sensor that will stop the charging if the batteries begin to overheat. This is another feature that is nice to have with an internal battery. You can actually turn this feature off, which I think is a little strange. I wouldn’t mess with this if I were you. The button setup is nice. The main fire button is under a whole-side trigger, and the plus and minus buttons are under a bar at the bottom of the screen. They aren’t actually marked, you just press on the left for minus and the right for plus. The responsiveness of all the buttons is good. While I really like the mod, I don’t like the EXCEED tank. It’s setup with two different airflow modes, one for mouth to lung (MTL) and one for direct lung (DL). There’s a separate coil for each. The MTL setup doesn’t work well. The DL setup works, but it’s extremely loud when you’re taking a draw. The connections for the different components are all threaded, but they don’t unscrew nicely. The CUBOID Lite mod would do a great job powering most tanks, but like I said above, I don’t like the EXCEED tank that this kit comes with. It’s supposed to have a MTL setup, but it doesn’t give an authentic MTL draw. I would not get this tank if you like this type of draw. There are much better options out there. As far as the direct lung setup goes, the vapor was good. I was able to get big clouds and flavorful vapor. The coil for this mode has a 0.5ohm resistance. As far as all this goes, it was enjoyable. The problem is the noise. This may not directly affect the vapor quality, but I found it annoying. It certainly distracted me every time I took a draw, which means I wasn’t able to actually focus on enjoying the vapor. The power flexibility of the CUBOID Lite is excellent. 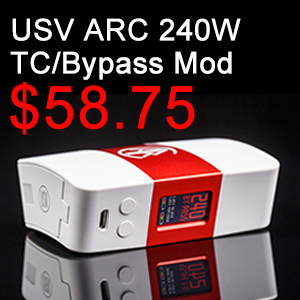 The mod can deliver up to 80W of power and has settings for temperature control. This includes the standard modes for stainless steel, nickel, and titanium coils, plus TCR settings. The temperature range is 200F to 600F. It also has a bypass mode. The minimum resistance for the wattage and bypass modes is 0.1ohm. For the TC modes, it’s 0.05ohm. This also has a cool safety feature that automatically adjusts the power if you accidentally try to use too much power with a high-resistance coil. This is very easy to use. The big, clear screen makes navigating the menu much easier than it is with most mods. The navigation really isn’t any different than it is with other recent Joyetech mods, so if you’ve used any you’ll be able to pick this up and start using it immediately. If you haven’t, it should only take a few minutes to get the hang of using. The portability of this is excellent. The dimensions are 67mm x 41mm x 26mm, not including the tank. This is plenty small enough to carry in your pocket in my opinion. The 3000mAh battery is also big enough to easily last you through at least a full day of vaping. 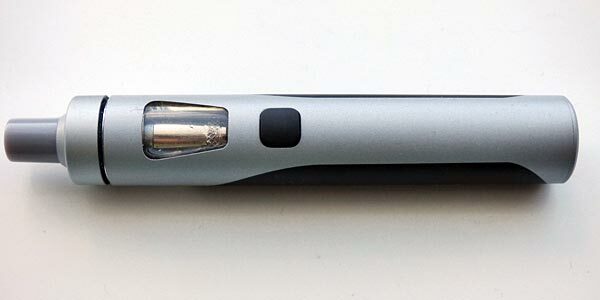 The only mods that offer more portability are the ones that have the tank built in or recessed beside the battery. I really like the CUBOID Lite. I don’t like the EXCEED tank at all. I’m not even going to bother saying much more about the tank. I don’t think it’s built well, and I highly recommend just getting the mod if you like the CUBOID Lite. As far as the mod goes, I think it is one of the best mods on the market in the 75-80W range. The combination of the big, colorful screen and the 3000mAh battery is really nice. It has all the settings that you could possibly want as well, but it still manages to be just as small as the Pico. The Atopack Dolphin Joyetech is a kit easy to use, reliable and provides a pleasant vape for a reasonable price. Evolution of Penguin , the kit Atopack Dolphin Joyetech does not look like an electronic cigarette, at least as we usually see them. Very compact and curvaceous, it offers a natural grip and ergonomic. The large button allows to trigger with the index finger, the palm of the thumb or even the palm with equal ease. This button has a firm and clean click, and it is the only one on this kit whose specifications favor simplicity of use. It takes 5 quick presses to turn it on or off, press to vape and we just go through the instructions. Just under the button, the micro USB plug allows to recharge the internal battery of 2100 mAh in one hour if you have a charger 2 A. The autonomy is satisfactory with the resistances of 1,2 ohm, but a little fair with those of 0.25 ohm. We can hold the day with the first, but it will provide an intermediate load with the most powerful. Finally, at the bottom of the facade, there is a row of 5 LEDs that indicate the remaining charge level of the battery. It is simple and largely sufficient, like the whole kit that allows to vaper pleasantly without the need for 3 days of learning. Before vapping, you must still install the resistor and fill the tank. And before that, you have to separate the tank from the battery, which is sometimes a bit difficult. Everything is made of shiny plastic, which is very pretty but just as slippery. And if the fingers and the kit are not perfectly clean and degreased, it slips, it does not come and it’s annoying. We get there in the end, but it’s too late, we’re annoyed, and why Joyetech has not planned a less slippery coating, no, but it’s true, what, in the end. To fill the tank, it is opened by the small silicone plug on the side. This leaves a hole wide enough for all common bottle tips, filling is easy and clean. The capacity is a comfortable 6 ml of liquid, we will not have to repeat the operation too often. It remains to place the resistance, starting by removing the plastic cover that replaces it before the first use. Again, no difficulty, just put the resistance in the right direction since it is not symmetrical. The resistors are also easy to remove for replacement. Whatever the resistance that is installed, it is she who defines the air intake since it is not adjustable on the kit. It is done by the two inputs on the tank, which have no adjustment device. It can be argued that this is a plus for ease of use, it is nonetheless a defect for versatility and vape approval. A defect to be moderated by the very design of the kit, the power is not adjustable anyway. The 0.25 ohm resistor (left on the picture) has a large inside diameter, which allows air to pass easily. We have an air flow, unrestrictive, perfect for direct inhalation. The production of steam is consistent, the rendering of flavors very satisfactory. The 1.2 ohm resistor has a thin inner diameter of about 1.2 mm. The airflow is restricted by all, and perfect for indirect inhalation. The Dolphin corrects the main deficiency of the Penguin that offers only direct inhalation. The production of steam is of course reduced, as the consumption of liquid, but the battery life significantly increased and the rendering of flavors surprisingly good. Whatever the resistance, the capillarity is good and I had no leak with one as with the other. 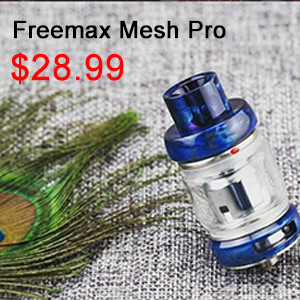 On the other hand, the liquid arrives on the cotton only from the top of the resistance, and with that of 0,25 ohm and a liquid in PG / 80 VG the rendering becomes less good if one vape several times of continuation. The bottom of the cotton should take longer to imbibe, and you end up having a little aftertaste cotton a little dry. It is enough to vape more slowly so that the cotton has the time to imbibe homogeneously, or to use a liquid in 30/70 for example. Nothing really bad. Our rating: 4/5 . The Atopack Dolphin from Joyetech is a very simple kit, compact, ergonomic and versatile. The vape it provides is pleasant, and it can be blamed only a flow of air not adjustable beyond the choice of resistance and a reservoir sometimes difficult to open. The capacity of 6 ml of liquid is generous, that of the battery a little less, especially with the resistances of 0.25 ohm. A very good kit anyway, which fixes the Penguin’s gap for indirect inhalation. 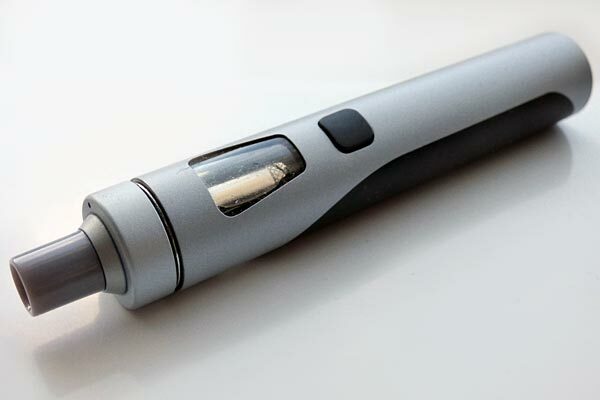 The eGo AIO by Joyetech is a discrete “pen” like device marketed at people who want to make the switch from smoking to vaping. 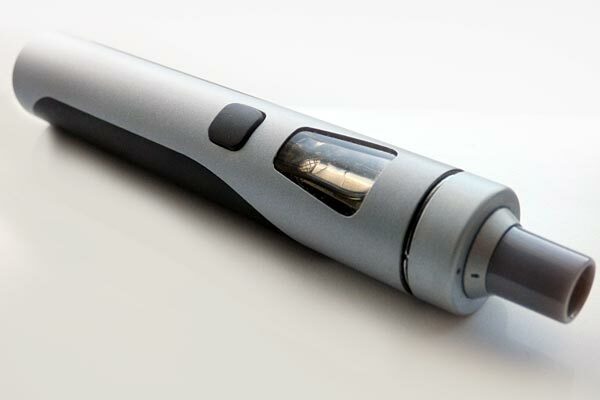 The device has a 1500mAh battery capacity and the integrated leak-proof tank holds 2ml of E-Liquid. It features convenient top filling and the top cap is a child-proof design. The eGO AIO is a nice and discrete device. It is also reasonably light and it feels comfortable to hold. The actual styling is kind of futuristic and I am not that keen on the two tone grey and black version that I received for review because it has a kind of plastic look. If I was buying one of these products I think I would go for either the full silver or the black which to me looks much better. Taste varies heavily between people so you might even like the styling. In terms of construction it feels decent and well put together. The fire button is comfortable and quite responsive with only a very slight rattle present. The device does light up while you vape but on the plus side of things it means you can see the juice level in the tank if you are prone to vaping in the dark. It can of course be switched off. The eGO AIO comes with two drip tips, a Delrin one and a Pyrex one. If you are serious about flavour then definitely use the Pyrex one even if it does tend to result in a lot of condensation build up. You can also swap it with a drip tip from your collection since the ones that I tried fitted without issues. 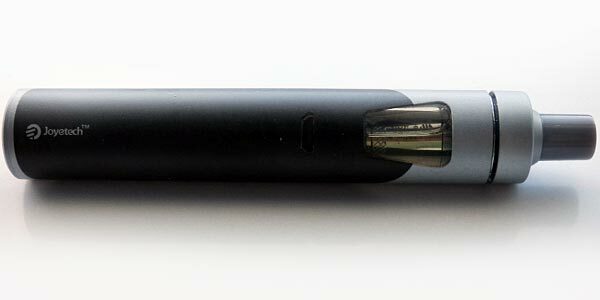 The tank holds 2ml of juice and is integrated into the device itself. In my opinion this is a shame since it makes things a little tricky when cleaning. Joyetech claims that the tank is completely leak-proof and I certainly did not come across any leaking while using this device. What I really think is a superb feature is the child-proof top cap which offers parents some peace of mind if they should accidentally leave this device lying around. We have had child proof E-Liquid bottles for ages so a child-proof tank is an ingenious idea. The upper most section of the top cap allows you to adjust the airflow to restrictive mouth to lung vaping and more opened up where it becomes more of a restrictive lung inhale kind of vape. The internal battery has a 1500mAh capacity which while decent enough for a modest user could be a little better. In fairness it is miles better than the limited capacity of the early eGO batteries that users like myself had to put with. The Micro USB port is located on the back of the tube just beneath one of the tank windows. There is a single air hole in the base of the device to provide battery ventilation. The included manual is actually rather good, everything is explained clearly along with diagrams and providing you take a few minutes to read it you will not run into any problems. The kit contains two identical coils and neither is pre-installed. In my opinion this is a good thing because it means you will learn how to fit it and also how to prime it. It also means you won’t just fill up the tank, press the fire button and burn out the coil. First time vapers should definitely read the included Coil Priming Card. The device does light up when you vape which I admit could get on peoples nerves. The light can be set to a choice of different colours and if you are really self-conscious about it you can thankfully switch it off. Switching the lighting off will also save a little on battery life. To get into the tank you need to press down the top cap before twisting since it is child-proof. The correct fill level is marked so do take care not to overfill because when you press down the top cap it will displace the juice and things could get messy fast. To adjust the airflow you twist the upper section of the top cap. The most open setting is when both of the little dots are aligned with one another. To set the tank to mouth to lung there is not an indicated setting but I found turning the upper section ninety degrees to be perfectly fine for a very restrictive vape. Considering I use a lot of high powered devices these days I will be honest and say I wasn’t expecting a great deal from a starter kit, I’m not knocking these kits at all just pointing out that my vaping has evolved. However the eGO AIO actually really surprised me. I had primed the coil and filled up the tank with some Monarch E-Liquids Citadel. I set the airflow to mouth to lung and took my first vape and remarkably it was really nice. Flavour was rather good, not at all washed out and I really liked the tight/restrictive draw because it was really close to what I was used to when I smoked. Vapour production was also rather generous and comparable to the amount of smoke a typical cigarette puts out. With the airflow fully opened up you can do direct lung inhales but it is still quite restricted. The vapour production increases by quite a degree but it is not as overkill as some Sub Ohm tanks. I guess you could compare the vapour production to the amount of smoke you would get if you put two cigarettes in your mouth and smoked both at the same time which I am sure plenty of us have done when heavily inebriated. No? Well perhaps that was just me back in the bad old days. I did find that flavour was even better and crisper if you make use of the included Pyrex drip tip. Tank capacity is a little limited but considering that you will be mainly vaping this device mouth to lung I don’t really think you will drain the juice too quickly. The device is not exactly high powered and you do have that nice top filling feature. 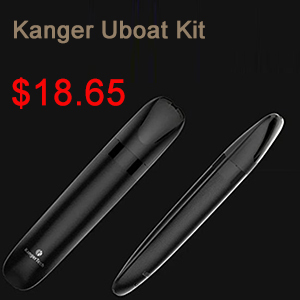 Providing you are a modest vaper the battery should last you all day long. Charging time was roughly 2-2.5 hours. Out of all the starter kits I have reviewed recently I feel that this product is certainly one of the most suitable for people switching from smoking to vaping. The reasoning is simple, this product offers a dedicated mouth to lung vape which is nice and restrictive. The coils offer good flavour and more than adequate vaper production. In addition the airflow options will allow a new user to gradually adjust to lung inhaling should they ever wish too. The product is extremely straightforward to use and safety features such as the child-proof top cap are very welcome if you have kids around. There are a few things I am not so keen on, firstly the battery capacity which while probably acceptable for modest vapers could do with being a little bit better considering the competition. Integrating the tank into the design is something of an issue since it means you have to be really careful when washing it out. Water could very easily make its way into the Micro USB port and we all know that water and electronics don’t mix. Personally if I was regularly using this device I would be tempted to put some masking tape over the port when cleaning. I have read mixed reports about the coils that come with this device burning out quickly. They are actually the same ones used in the Cubis tank and to be fair to the manufacturer I have not had any issues with them so that could be down to a couple of dud batches. Of course you do need to keep in mind that I have only used this device for a couple of days but realistically Stainless Steel coils typically have a decent lifespan and you do get two in the kit. In my opinion the good points about this product outweigh the negative ones and I feel that if you would like to make the switch from smoking to vaping then the eGO AIO is a very worthwhile product for a first time user. I liked it a lot and I really wish I could have got one of these over three years ago! 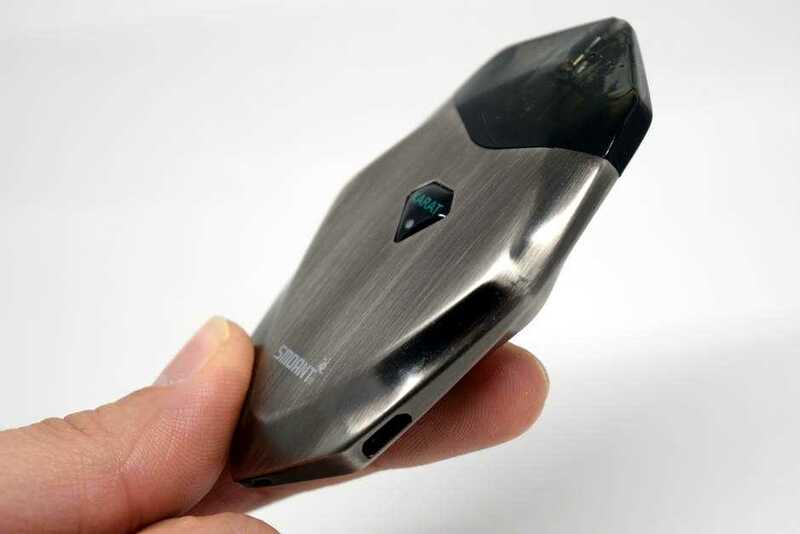 The company Hugo Vapor has released a device Orbiter GT230. 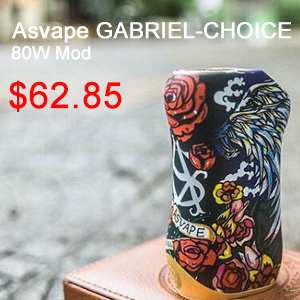 The lightweight box mod has a bright ergonomic design, a color display and a maximum power of 230 watts. June 12, the company Hugo Vapor introduced in instagrame new device Orbiter GT230 . Boksmod performed in ergonomic form with smooth lines and a complete lack of angles, in three bright patterns. The body was made of plastic and covered with nylon, due to which the weight of the device was significantly reduced. The landing area received a diameter of 30 mm, as well as a relief pattern in the shape of a star of David. 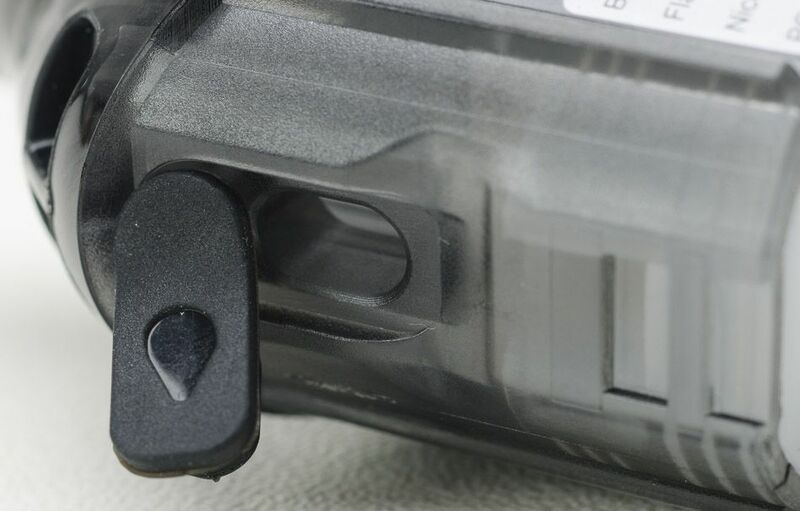 The fire button was given a certain resemblance to the trigger and sent to the front side of the handle. At the end there was a panel with a color display, three control buttons and a USB port. A hinged battery cover was installed at the bottom. The device is powered by two 18650 batteries, each has a separate indicator. Charging via USB-port current up to 2A. The board supports varivatt, thermal control and custom mode settings. 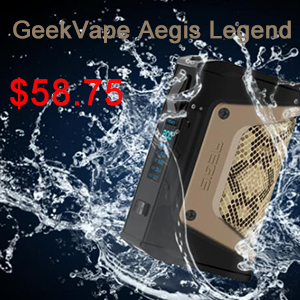 Gives a box mod up to 230 watts of power. The resistance range is 0.06 to 3 ohms. The device comes with a USB cable and instructions. 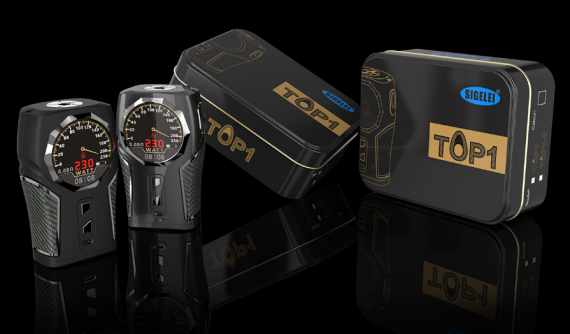 Sigelei TOP1 Box Mod – how do you call a yacht, so it will sail ??? 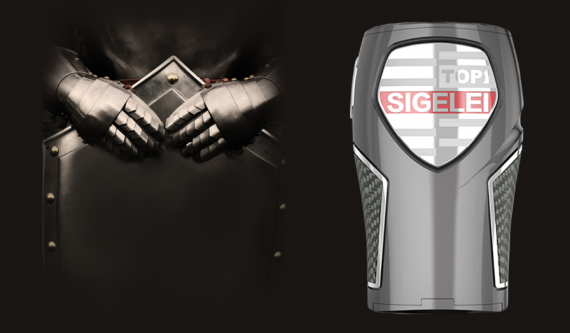 The company Sigelei, which is overgrown with brands-daughters from all sides, has released another new product. 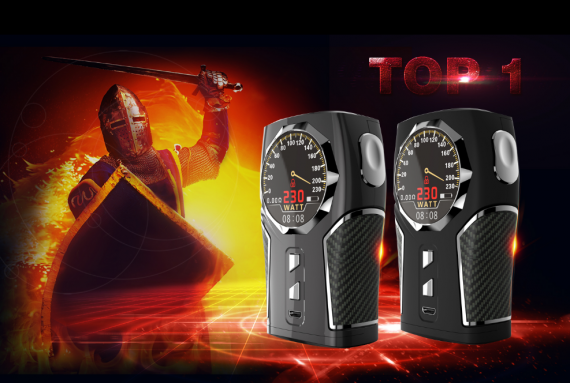 This is a boxing mod with a promising and “immodest” name Sigelei TOP1 Box Mod . Let’s try to find out together what this copy deserved the highest place on the “podium”. The design is rather controversial, in the sense that it will go down to many and become the top 1 in the ranking. Developers “treacherously” draw a parallel with knights, their armor and weapons. As for me, except for a stylized shield on the back of the device, nothing more sends us back to the times of valiant warriors. Or, perhaps, the carbon carbon side inserts cause someone to associate with the Middle Ages ??? At first glance, this device reminded the products of the company REV. Well, this is understandable – all because of the similar design of the desktop display. But in real life, at least kill me, I have only one association – this is a thing, like a pressure gauge called, which shows the pressure in household tonometers. The landing area and the connector are made of steel. Landing large atoms should be “successful”, I think, even 25mm will sit comfortably. The fire button is located on a smaller end, it is elongated and has a small indentation – it promises to be comfortable. The control panel fits a large HD screen that doesn’t look very good, although the information on it is easy to read, and there are no bright and “eye-cutting” colors in the color scheme. Immediately control buttons and charging connector. Performance, as always, excellent. As a power supply, the box mod uses only 18650 batteries, which is rather strange. Access to the latter is at the expense of a hinged cover at the base of the device. The price is currently unknown, since the release took place only this morning. 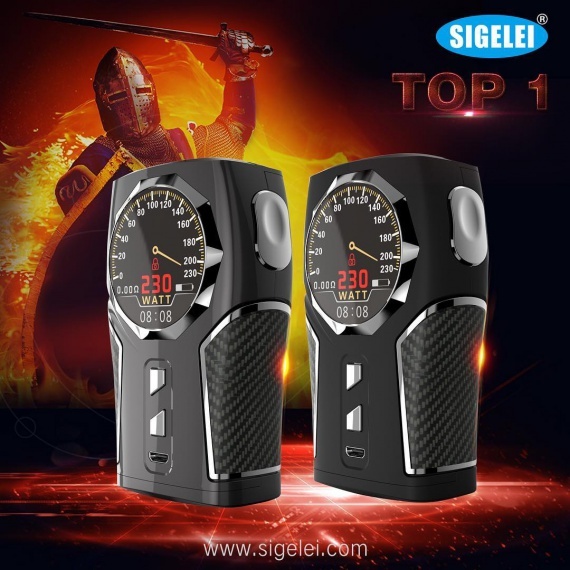 Author kittyurvapinPosted on January 22, 2019 Categories UncategorizedLeave a comment on Sigelei TOP1 Box Mod – how do you call a yacht, so it will sail ?? ?